Charles Lewis III, getting the worm. Free wine – the only reason I do theatre. As I continue my contemplation about the theatrical “ecosystem,” I recently took a moment to ponder the act of seeing something early. What does the audience think when they see a preview performance for a play or early screening of a film – are they hoping to see the next great masterpiece? Do they want to be ahead of the curve in bashing the next great disaster? Or are they like me in that they just want to escape from the world and were persuaded to do so by the discounted (or free) price? Previews are a necessary evil: they’re billed as being works in progress; a peek behind the curtain of artistic evolution. This reasoning is meant to excuse what ever stumbles the production encounters in this performance (“It’ll be better in the show proper; we promise!”), but simultaneously sell the bright spots as on the verge of growing brighter (“You ain’t seen nothin’ yet, folks!”). Notorious Broadway debacle Spider-Man: Turn Off the Dark had the longest preview period in history with 182 pre-opening performances. You could argue that audiences and critics had their daggers out before the first curtain rose, but the show apparently showed little – if any – improvement during its run. I opened a play last week after two preview performances. After months of memorizing lines and contemplating character motivation, I don’t have a damn clue what the audiences have thought of us so far. With that show occupying much of my life of late, I took advantage of the rare opportunity to be part of an audience this week. 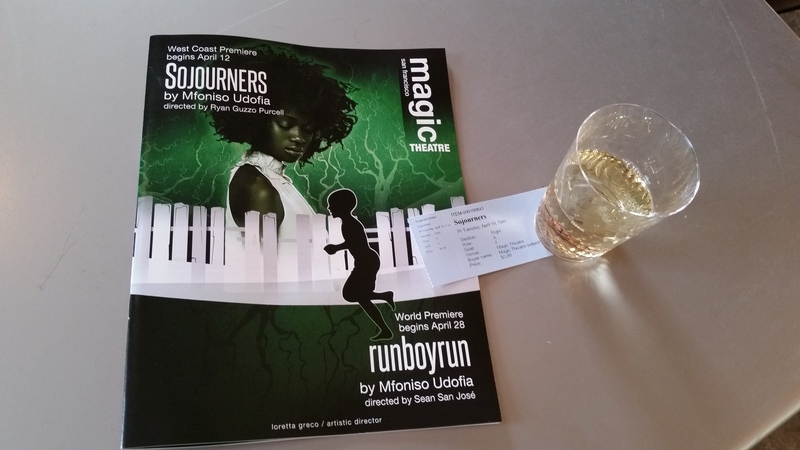 This past Tuesday, I attended the Industry Night (so cool to be thought of a part of “the industry”) performance of Mfoniso Udofia’s Sojourners at the Magic Theatre. I knew practically nothing about the play going in, but I’d heard that Udofia is a resident playwright at the Magic and that Rotimi Agbabiaka – one of the best working actors in the Bay Area – would playing an important role. Free ticket, free wine, rub elbows with local theatre bigwigs – how could I resist? I didn’t see the playwright herself that night, but the pre-show speech mentioned that the show is intended to be the first chapter of a nine-play cycle (Ch. 2, runboyrun, opens at the Magic on April 28) of Nigerian characters in the United States. An ambitious venture to be sure. In the “Blood and Brain” interview inside the program, Udofia explains that she “started with one play and thought [she] was done.” That one play became a trilogy which soon proved not enough. So was I watching the start of the next theatrical story cycle – a la August Wilson’s “Pittsburgh Cycle” or Tom Stoppard’s “Coast of Utopia”? I don’t know. Hell, I didn’t even consider the multi-chapter angle until the very end of the play. I doubt anyone else did either. All I can say for sure was that I know how I reacted to what I saw then and there. That’s what’s most important about previews: not what they represent for the future, but what effect they have right here and now. I play to see runboyrun in early May, and my own play continues performances tonight. Just yesterday I had my costume fitting for the SF Opera (it’s a cool costume that I’d honestly wear in public, if I could). I’m tinkering over pages for my Olympians script as I mull over upcoming auditions. I’ve also recently been offered a directing opportunity that I’m seriously pondering. In short, I have a pretty good idea as to what my theatrical future holds. That’s not going to stop me from living fully in the present. Charles Lewis III is a writer, director, actor, and creator of the Flux Capacitor. No, you can’t see it.